The WT1800E is a high-performance power analyzer that guarantees power accuracy of 0.05% of reading plus 0.05% of range. 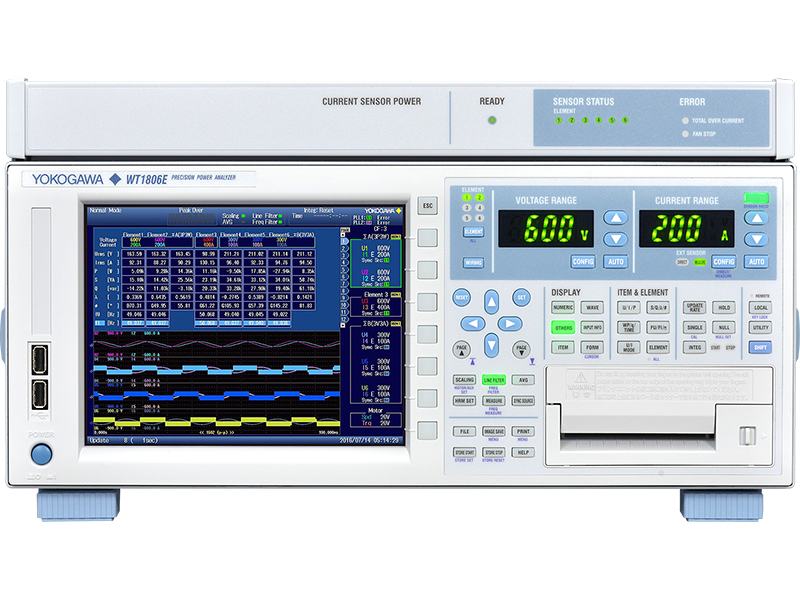 It is capable of harmonics analysis up to the 500th order of a 50/60 Hz fundamental frequency. With up to 6 input channels, a wide range of display and analysis features, and PC connectivity, the WT1800E is the ideal tool for engineers to accurately measure power characteristics and efficiency of electrical devices. 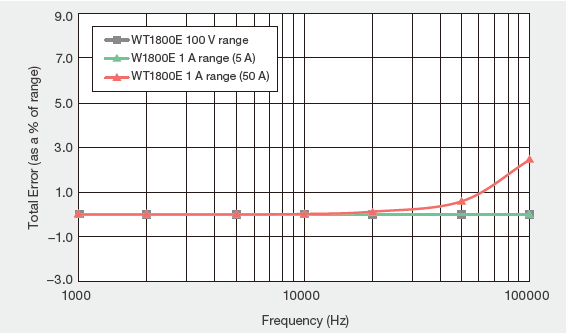 The WT1800E guarantees a power accuracy of 0.05% of reading plus 0.05% of range and is capable of harmonics analysis up to the 500th order of a 50/60 Hz fundamental frequency. 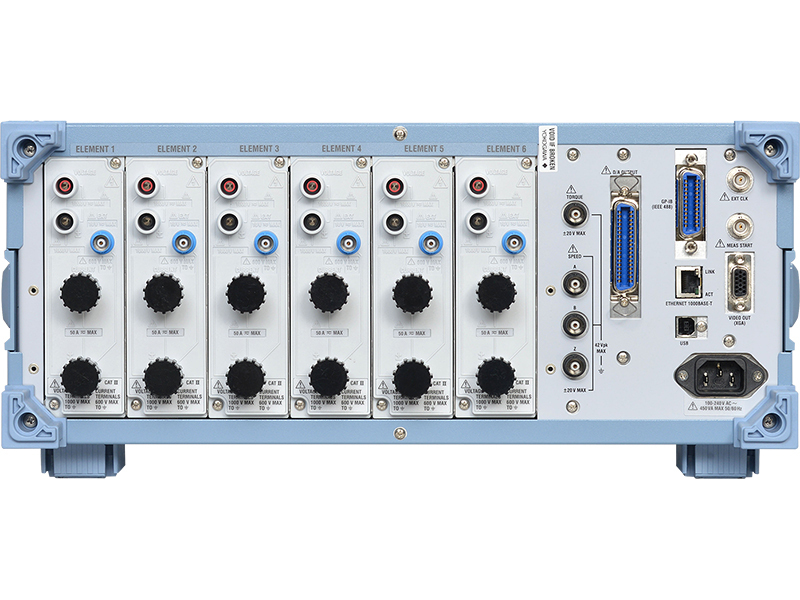 With up to 6 input channels, a wide range of display / analysis features, and PC connectivity, the WT1800E is the measurement solution for a broad range of power efficiency and harmonic analysis applications. Make simultaneous measurements on up to 6 inputs at 2 MS/s (16 bits). The high resolution 8.4 inch XGA display of the WT1800E allows split screen viewing of up to 6 waveforms and can display up to 12 pages of diverse measurement parameters making it ideal for efficiency tests of inverter driven motors, renewable energy technologies and traction applications like pumps, fans, and hybrid/electric vehicles. 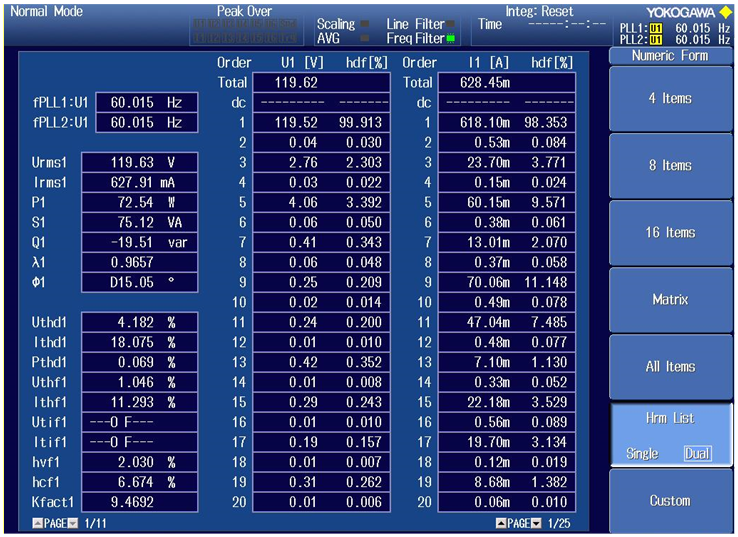 The unit can also display measurements in vector format or trending in time. Measure accurately at a wide range of voltage, current and frequency conditions. The basic power accuracy of the WT1800E is guaranteed between 1% to 110% of the selected voltage and current range. This equates to voltages from 15 mV to 1100 V rms and currents from 0.1 mA to 5.5 A rms (for a 5 A input element) and 10 mA to 55 A rms (for a 50 A input element). The unit is also accurate during large phase shifts and high frequencies thanks to the minimized influence of the low power factor error (±0.07% of apparent power). Track signal changes faster by eliminating unnecessary range changes. The WT1800E’s range configuration function allows users to select input ranges based on their specific use cases so that optimal range settings are achieved quicker. This reduces the time during repetitive production tests, such as setting to OFF, 100 V, OFF and so on, which is performed frequently on the production line. 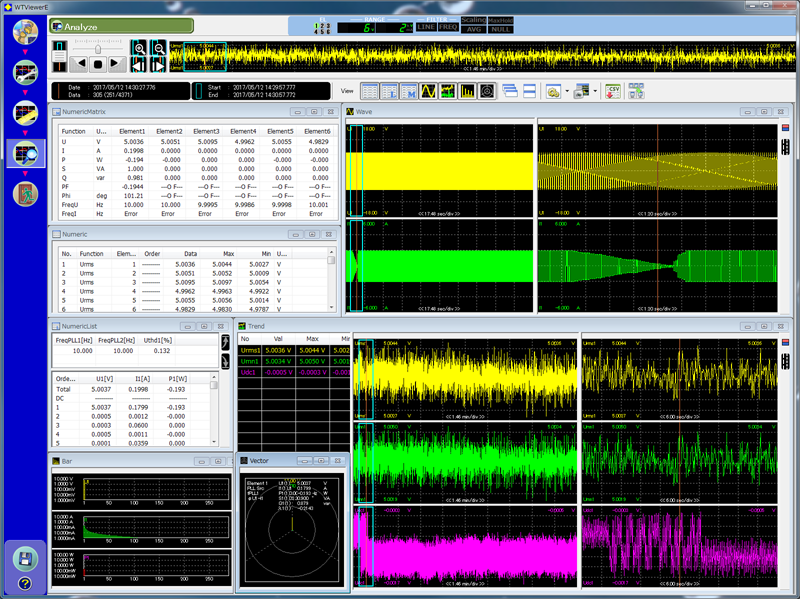 Analyze harmonics up to the 500th order for a 50/60 Hz fundamental even at a data update interval of 50 milliseconds. 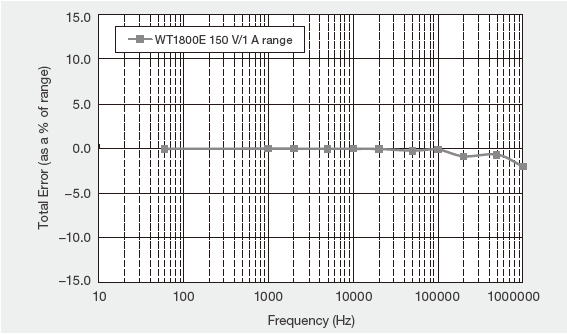 The WT1800E features two options for analyzing harmonics in addition to power parameters. Dual Harmonic option (/G6 option) for side by side measurement of harmonics on two different sources for example input and output of inverters, variable speed motors, lighting ballasts, UPS, etc. Measure energy bought/soldn grid connections or charged/discharged in batteries. The WT1800E’s Power integration function integrates instantaneous values for both positive and negative readings. It also measures total energy (Wh) and current (Ah) when load conditions vary widely such as in devices transitioning from standby to operation mode. Should an input signal start to fall out of the expected range, this function can automatically adjust the range while continuing to integrate the measured values. 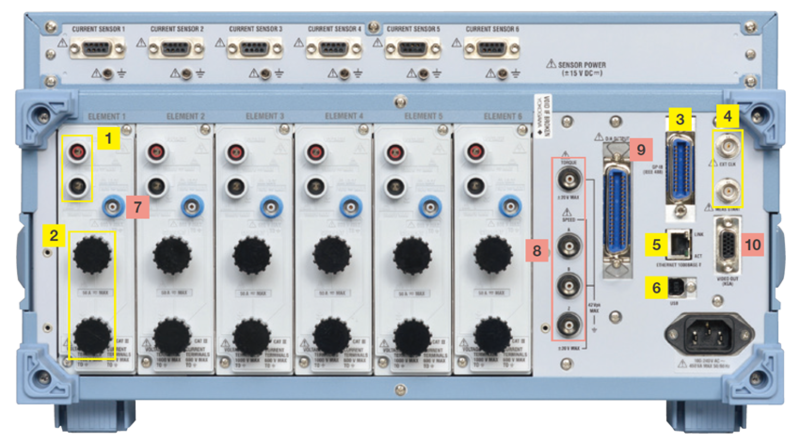 The high-speed data capturing function can measure Sigma-Urms, Sigma-Irms, and Sigma-P from DC signal and three phase devices every 5 ms when External Synchronization is OFF. It can also update at 1 ms to 100 ms when External Synchronization is ON depending on the frequency of the clock signal. 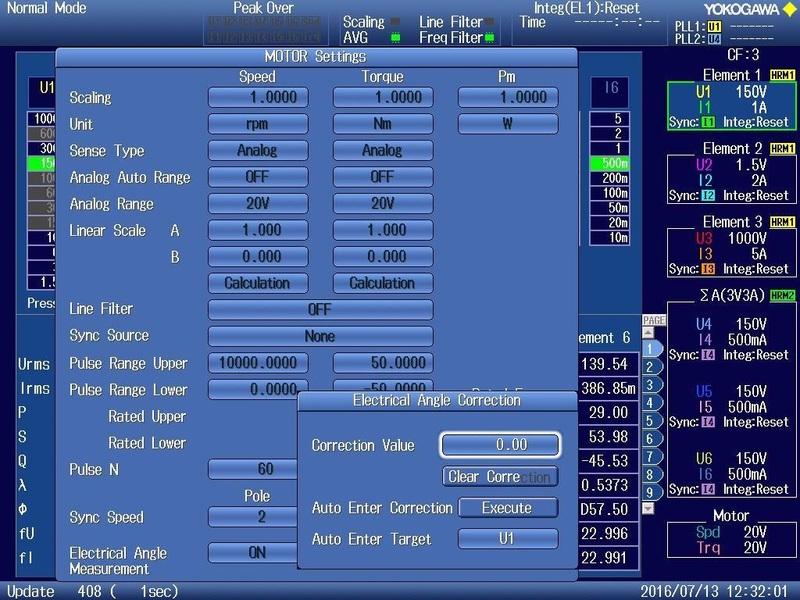 Manually or automatically set measurement intervals. The WT1800E offers 9 data update interval between 50 ms to 20 s but can also follow fluctuating input frequencies by changing the data update rate automatically. 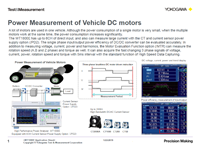 This is useful when measuring devices like motors whose input signal frequency varies with RPM. The WT1800E can be equipped with a DC power supply for the CT series of AC/DC current sensors. By using dedicated connection cables and shunt resistors, the WT1800E can measure large currents. Improved S/N ratio and noise immunity is achieved by connecting the sensors in this way. * /EX1 to /EX6 option must be installed in the WT1800E to be able to use the Shunt Resistor Box. 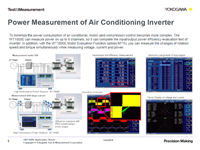 Measure more than just electrical parameters. 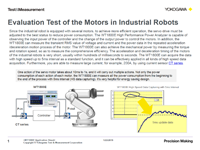 The motor evaluation function enables measurement of rotation speed and direction, torque, mechanical power, synchronous speed, slip, electrical angle, motor efficiency and total system efficiency from the analog or pulse outputs of rotation and torque sensors. 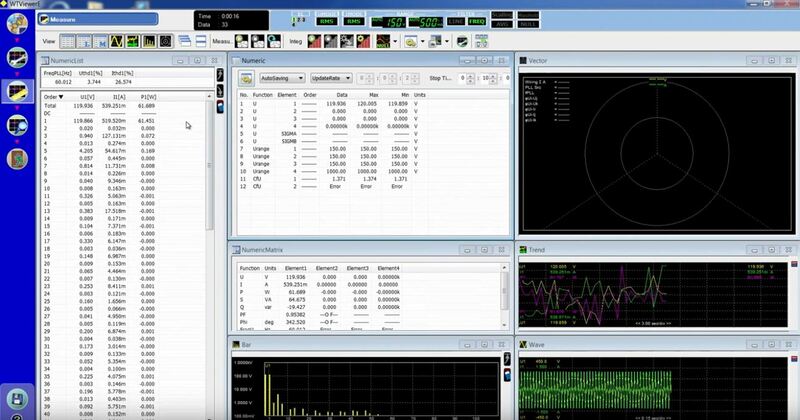 WTViewerE software enables PC connectivity for Yokogawa power analyzers such as the WT3000E, WT1800E, WT500 and WT300E through Ethernet, USB, GPIB or RS232. This connectivity allows users to easily control, monitor, collect, analyze, and save measurements remotely. 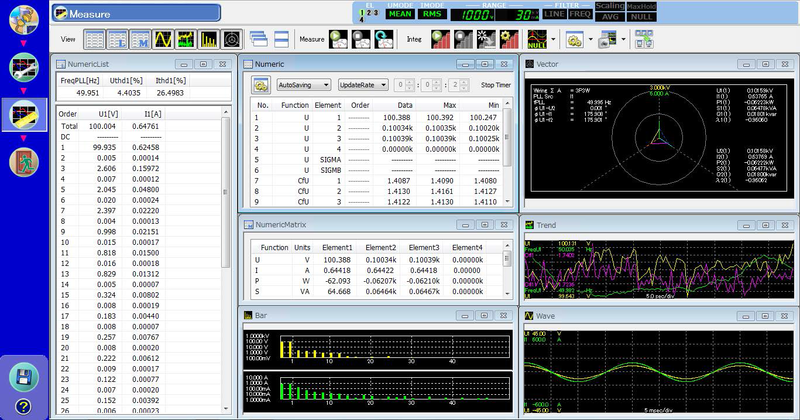 Easily view, control and download measurements from your PC. 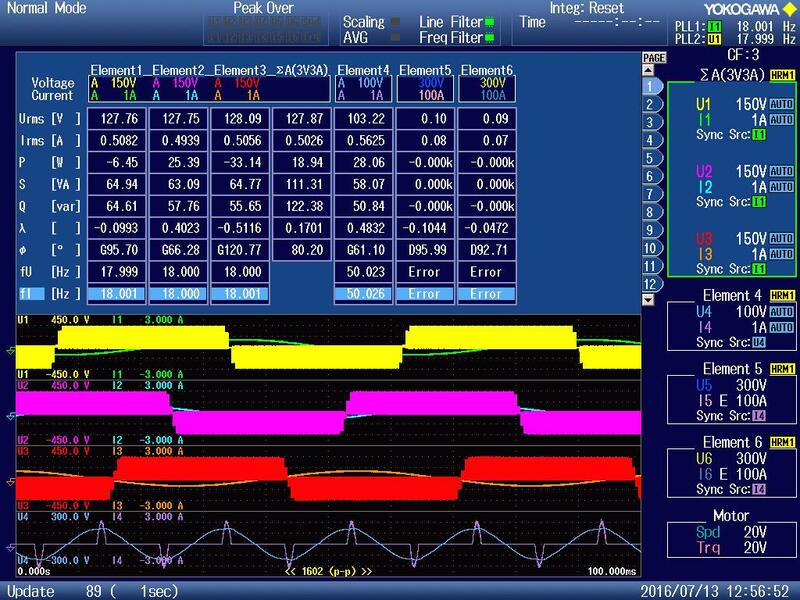 The WTViewerEfree is free software that connects the WT1800E to a PC via a communications interface making numeric, waveform, trend and harmonic data easily accessible via PC. The event trigger function of the WT1800E allows users to set limits for the capture of readings that fall into or out of a specific range of power, current or other parameters. Data that meets the trigger conditions are stored, printed, saved to a USB memory device etc. Users can also define and use up to 20 expressions for custom calculations. 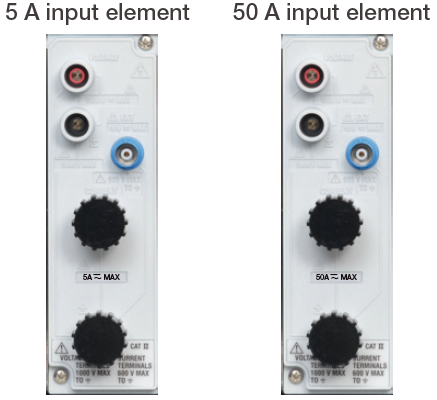 Both 5A and 50A input elements can be installed in a single unit. This enables engineers to use a single WT1800E for multiple applications such as standby power measurement and the evaluation of various operating modes of the device under test. Electric and hybrid vehicles have many electrical and mechanical components and therefore an overall performance evaluation requires the efficiency measurement of both. With 6 channels of power inputs, flexible operation and a wide bandwidth, the WT1800E is ideal for efficiency tests between the input and output of inverters. An optional motor evaluation function enables the measurement of rotation speed and changes in torque. Obtain the line and phase voltages from the sums and differences of the instantaneous values of voltage and current in each element. Line voltages and phase currents that are not measured are computed in the three-phase three-wire system (Figure 1). Star-delta conversion: Line voltage is computed from the phase voltage using the three-phase four-wire system data. Delta-star conversion: Phase voltage is computed from the line voltage in the three-phase three-wire system (3V3A system) (Figure 2). The WT1800E is capable of 16-bit high resolution and 2 MHz sampling making it possible to measure faster signals with higher precision. Measure rotation speed, torque, and output (mechanical power) of motors from analog/pulse inputs of rotation or torque sensors. 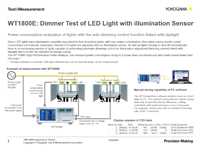 Simultaneously measure distortion factors like THD, fundamental and harmonic components. Harmonics up to the 500th order can be measured even at 50 ms data update rate. Users can also measure harmonics on two different sources simultaneously. In integrated measurement, the battery charge and discharge can be evaluated. Instantaneous positive and negative values captured at a high-speed sampling rate of 2 MS/s are integrated. 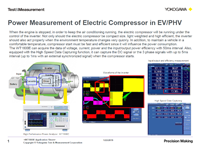 In the power evaluation of inverter waveforms, measurement values are affected by high frequency components. A digital filter function makes it possible to remove unnecessary high frequency components superimposed on signals. The filter can be independently set for each input element. An analog filter for 1 MHz/ 300 kHz, and a digital filter that can be set from 100 Hz to 100 kHz in increments of 100 Hz are available as standard. Energy generated by photovoltaic cell modules and wind turbines is converted from DC to AC by a power conditioner. Minimizing losses in these conversions improves the efficiency in the overall energy system. The WT1800E provides up to 6 power inputs per unit for measuring voltage, current, power, and frequency (for AC) before and after each converter, as well as the converter and charging efficiencies. 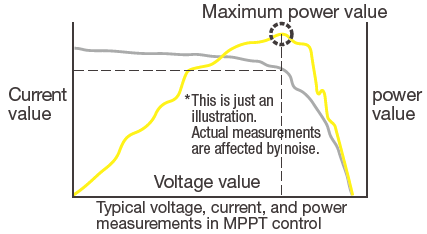 In photovoltaic power generation, an MPPT control varies the voltage to maximize energy harvested from the solar panel. The WT1800E can measure not only the voltage, current, and power but also the voltage, current, and power peak values for both plus (+) and minus (−) sides. 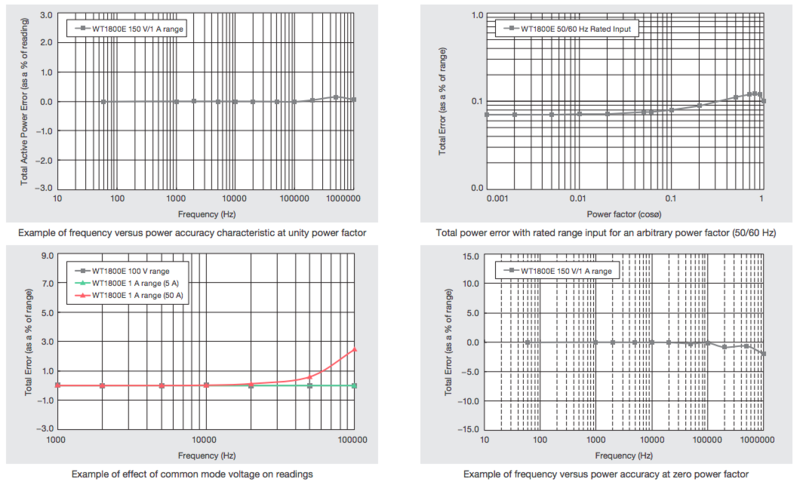 Evaluate Power conditioner efficiency using 6 input channels for simultaneous measurements from the inputs and outputs of boost converter, inverter, and storage battery. Direct input terminals (voltage range: 1.5 V to 1000 V and current range: 10 mA to 5 A or 1 A to 50 A) make it possible to perform high-precision measurements without using a current sensor. 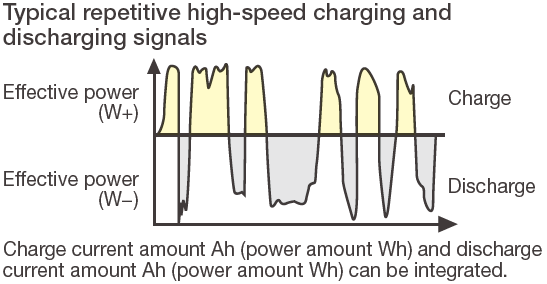 Voltage fluctuations and harmonics flow into the power system due to reverse power flow. A harmonic measurement function enables measurement of harmonic components to compute and display total harmonic distortion (THD). A user-defined function makes it possible to compute power loss, DC voltage and DC current ripple factors between the input and output. Up to 20 arithmetic expressions can be set. Display names for the arithmetic operations F1, F2, and so on can be freely changed. Measure the amount of power sold/bought in grid interconnection and of battery charge/discharge. Measure the amount of power sold/ bought in grid interconnections and in battery charge/discharges. The WT1800E enables the integration of current (q), apparent power (WS), reactive power (WQ), as well as the effective power integration in sold/bought power and charge/discharge modes. Furthermore, a user-defined function makes it possible to calculate the Average active power within the integration period. The WT1800E supports power measurements on up to 6 input channels making it ideal for evaluating the efficiency between the input and output of an electric vehicle. An optional motor evaluation function makes it possible to simultaneously monitor voltage, current, and power changes, as well as changes in rotation speed, torque and mechanical power. In integrated measurement, the battery charge and discharge can be evaluated. Instantaneous positive and negative values captured at 2 MS/s high-speed sampling rate are integrated, and each of the total values is displayed. The WT1800E is capable of 16-bit high resolution and 2 MHz sampling making it possible to measure faster signals with greater precision. Motor testing is performed at various rotation speeds. 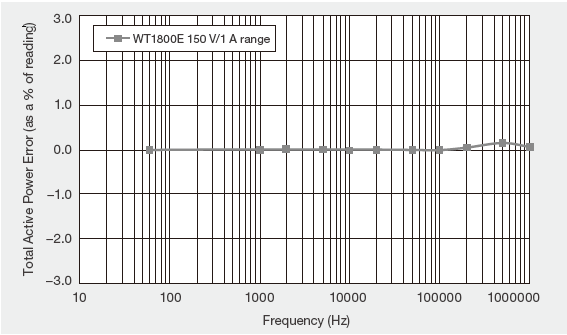 The WT1800E supports a lower limit frequency of 0.1 Hz to enable measurement of harmonics at a very low motor rotation speed without using an external sampling clock. 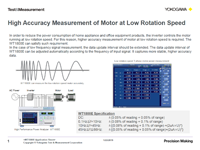 Measure rotation speed, torque, and output (mechanical) power of motors from analog/pulse outputs of rotation or torque sensors. 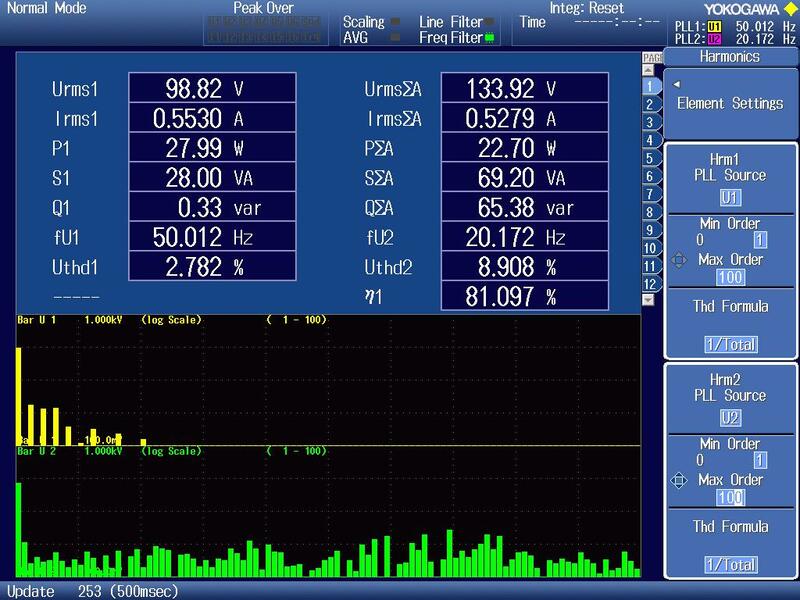 A common problem when testing inverter motors is the presence of ambient noise that can mean test values are non-zero even before testing begins. The WT1800E’s null function allows users to enable, disable or reset the offset values for voltage, current and motor input signals of each element separately. Users may want to check changes in data, along with other measurement data (temperature, etc.) at the same time that communication data, such as voltage, current, power, and efficiency are required. 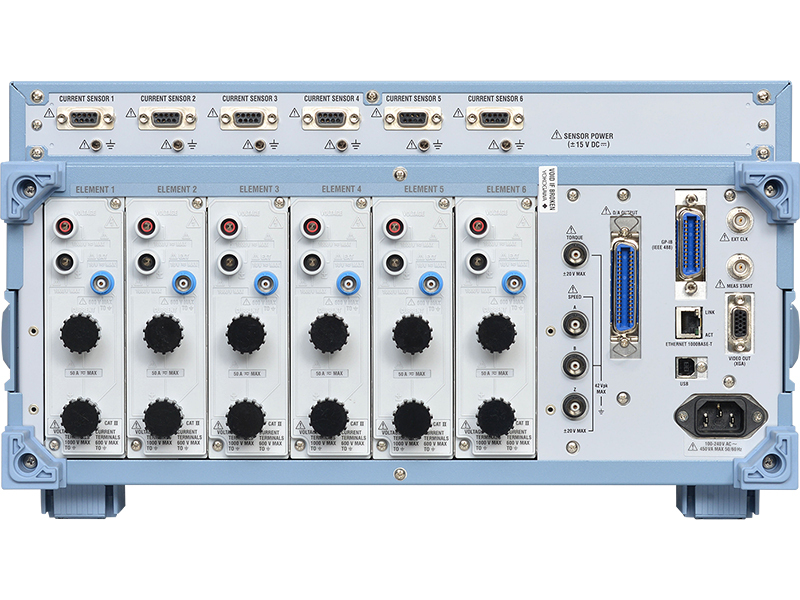 A DA output function allows users to generate analog signals on up to 20 channels. Dedicated Cables for WT1800E /PD option. Direct Current Input Cable (with Burden Resistor 2.7 Ohm) for WT1800E /PD2 option. For connection the external input of the WT3000 to the current sensor. Current sensor unit accessories for digital power meters and power analyzers. 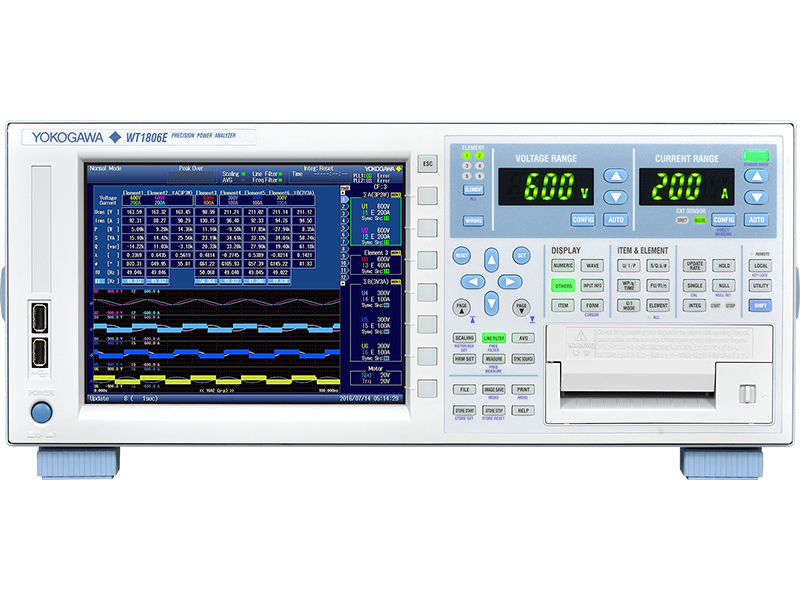 DC to 100 kHz/1000 a peak guaranteed calibration with power analyzers. Shunt resistor boxes for WT1800E /PD option. If a product uses power, then power consumption and power quality measurements must be made as part of product design and test. These measurements are essential to optimize product design, comply with standards and provide nameplate information to customers. This article will discuss best practices for making these measurements, starting with power measurement basics and proceeding to the types of instruments and associated components typically used to make measurements. The article will conclude with real-world examples, which apply the information imparted earlier in the article to solve practical measurement problems. Although most of us have been exposed to basic power measurement equations, a primer is helpful to summarize this information and to show how it applies to product design and test. It is possible to obtain the differential voltage, line voltage, phase voltage, etc. by obtaining the sums and differences of instantaneous measurement values of voltage and current in each element. 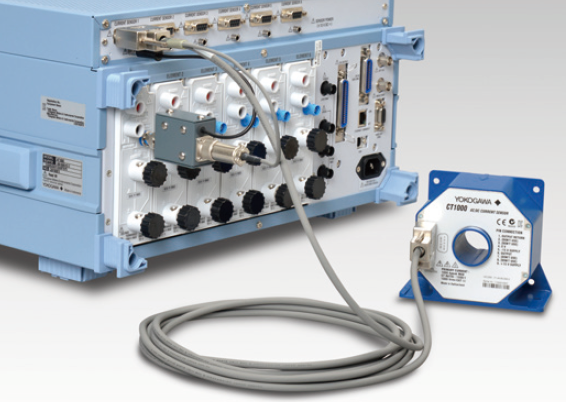 This white paper describes the WT1800, a precision power analyzer that has been replaced by the WT1800E, a unit with numerous improvements including better accuracy. Please visit the WT1800E product page to learn more about the WT1800E. To keep pace with the increasing speed of switching devices in inverters, Yokogawa has developed the WT1800 precision power analyzer with 10 times faster sampling speed and 5 times wider frequency bandwidth compared with previous models. Its basic accuracy is 0.15% and the frequency bandwidth of voltage and current is 0.1 Hz to 5 MHz (-3 dB, Typical) including the DC component. With up to six inputs, a single WT1800 unit can measure the efficiency of three-phase inverters. In addition, the high-speed data capturing mode allows the WT1800 to measure transient power. 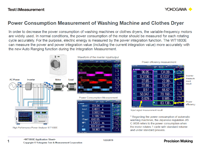 This paper describes the high-speed, real-time power measurement technologies underlying these functions. 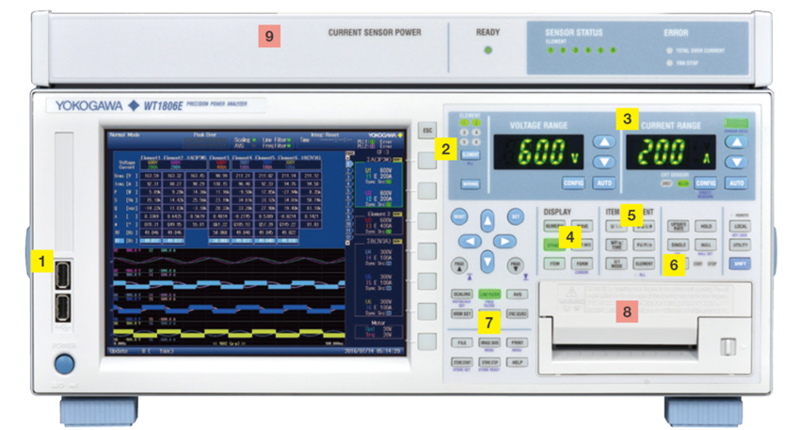 This white paper describes the WT1600 precision power analyzer, a model that has been discontinued and replaced with the WT1800E. Please visit the WT1800E product page for more information regarding the WT1800E. We have developed the WT1600, a high-precision, wide-bandwidth power meter. 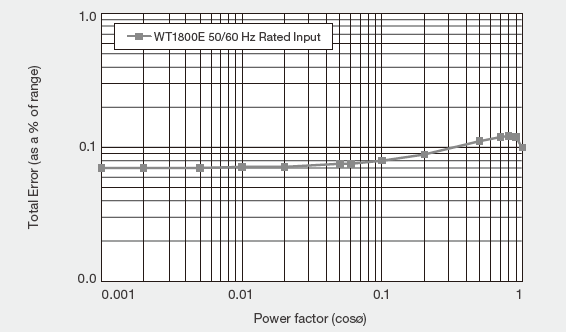 The WT1600 can measure DC and AC signals from 0.5 Hz to 1 MHz with a basic power accuracy of 0.1%. With the maximum of six input elements installed, a single WT1600 can measure the efficiency of a three-phase inverter. In addition to the functions of conventional power meters, it has wider ranges and various functions including waveform display. This paper gives an outline of the WT1600. 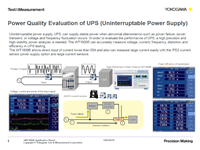 The Power Analyzer Accuracy and Basic Uncertainty Calculator can be used to determine the uncertainty in voltage, current, and active power (watts) measurement values for various frequency ranges and wiring systems. Are you achieving the levels of accuracy you need? This article outlines the top reasons for inaccuracies in power measurements and how to tackle them. The accuracy of a measurement instrument varies with the range over which a reading is measured. But what if different manufacturers specify this range differently in their instruments? This article explores the impact of range definitions on measurement accuracy and how one can be mindful when comparing accuracy across instruments. Energy efficiency directives from bodies like International Electro technical Commission (IEC), European commission, California Energy Commission (CEC) and others govern standards across various classes of electrical, electronic and mechatronic equipment. 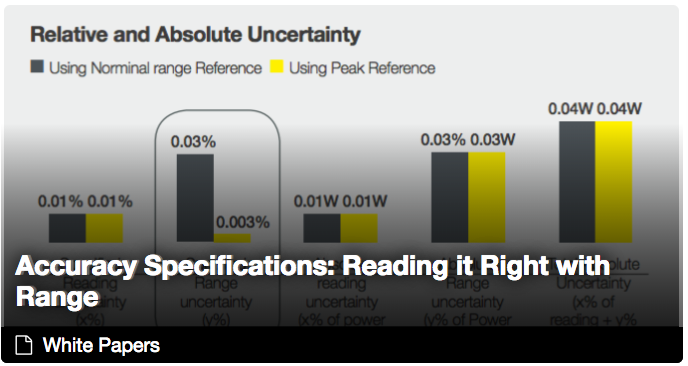 This infographic provides a snapshot guide for making reliable power measurements across your product development lifecycle with particular emphasis on the high accuracy needs of compliance testing. As the manufacturer of the world's first drone to combine Vertical Take Off and Landing (VTOL) and forward flight, ATMOS UAV needed to perform highly accurate motor system testing, while keeping the test time as short as possible. Discover how Marlyn exceeded all expectations in terms of reliability and was successfully launched in an extremely competitive market.